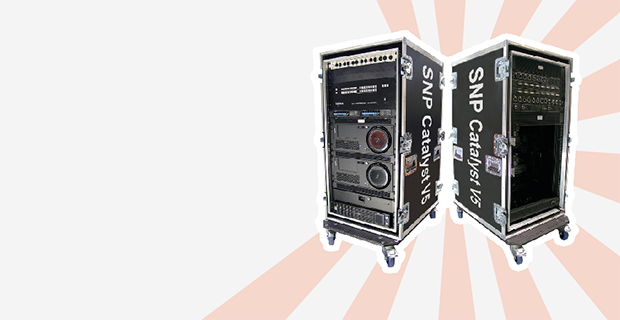 One of the companies at the forefront of this revolution is SNP Productions Ltd, an outfit that specialises in Catalyst media servers. They have worked with crews worldwide to inject real passion and drama into UK events such as the Brit Awards at the O2 London and NFL at Wembley Stadium, London. It has also supplied systems into the Middle East for headline events including X-Factor Lebanon and Arabs Got Talent. What each of these projects have in common, says Simon Pugsley of SNP, is the need to astonish their audiences. The days of a colourful draped backdrops are over. We now have to work with creative directors to deliver stunning multimedia results, whatever the venue and wherever the event is held. The need to travel to any location brings with it special demands: the crew need a high performance live play-out system that is fully portable and can be up and running quickly. Reliability and mobility are crucial to give technicians peace of mind that the creative vision can be delivered without a hitch. The Catalyst software that SNP specialises in features the ability to blend, map, manipulate and control multiple live sources and animated content. This gives directors the ultimate in creative freedom. To achieve the event organisers vision, there can be no compromise in terms of processing power, regardless of the remoteness of the location. The new Mac Pros cylindrical design may be aesthetically appealing but its completely impractical in a 19 rack frame. Its lack of internal expansion is also a flaw - adding storage, PCI cards and professional connectivity is nowhere near as straightforward as it used to be. In the live events business, we need technology to be totally versatile we work with up-to 6x MDP outputs and have to make changes to the hardware configuration for every event. In its raw state, the Mac Pro had the power, but not the adaptability we needed. Continues Simon. The solution came in the way of the Sonnet xMacPro enclosure, which is specifically designed around the new Mac Pro 6.1. It converts the workstation for use in a standard rack, but more importantly, it leverages the performance of the Thunderbolt 2 port to allow users to add multiple PCI cards, external optical drives, LTO decks and RAID storage. SNP use the full potential of the xMacPro, radically expanding its capabilities with a specialist HD-SDI video input card, Sonnet multi-port USB 3 adapter and a Sonnet Tempo PCIe 512G SSD Card to provide additional high speed fast access storage at 1100MB/s. The UPS-protected 23RU rack also encloses a MOTU USB audio interface, DMX interface and a Lightware 16x16 DVI matrix. The xMac Pro is a great solution and well engineered. It provides a secure housing for the MacPro and offers flexible expansion capabilities. Concludes Simon.